Skirt, Tissu simultané no. 186, France, ca. 1926; block printed wool jersey. For me, there was no gap between my painting and what is called my "decorative" work...I never considered the "minor arts" to be artistically frustrating; on the contrary, it was an extension of my art, it showed me new ways, while using the same method. 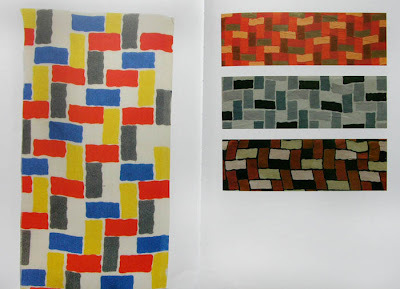 It wasn't until a couple of years ago that I became aware of Sonia Delaunay's textile work; I knew of her as a painter of brightly colored abstractions, which she and her husband Robert Delaunay called Orphism. 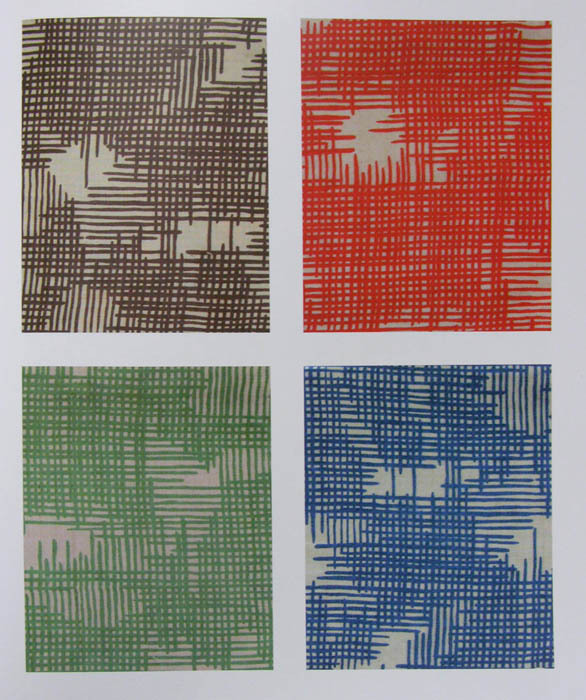 I wrote about discovering her design work, along with others, in a blog post on textile design, which you can see here. Then last spring, I was lucky enough to be able to see the very exciting show of Delaunay's textile work at the Cooper-Hewitt museum. 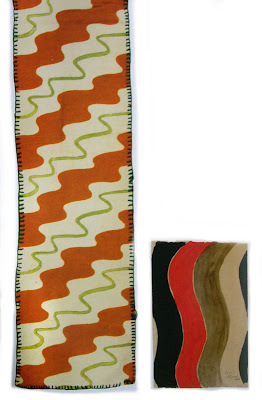 Scarf, Tissu simultané no. 14, France 1924-5; block printed cotton. Project de tissu simultané no. 33, France 1924; watercolor on paper. I saw rooms full of vibrant color and marvelously inventive designs– geometries, swirls, squiggles, florals – an unending run of ideas. The title "simultaneous" comes from Robert Delaunay's theory of color relationships, which he called Simultaneism. I later ordered the catalog for the show, Color Moves: Art & Fashion by Sonia Delaunay, from which I photographed all the images in this post, and it was quite difficult to choose just a few. 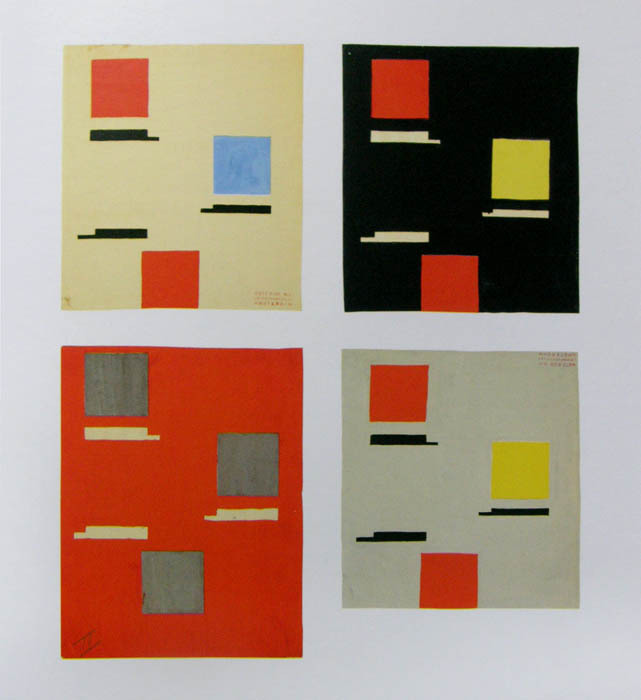 Design C53, France, 1924; gouache and pencil. 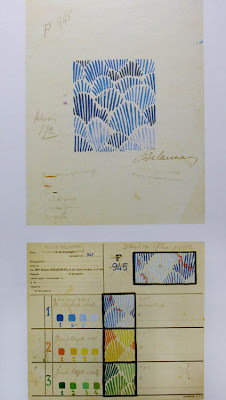 Because I've been interested in pattern lately – see a recent textile of mine here, and a post on pattern at the Metropolitan Museum of Art here – I thought I'd do this post on Delaunay's design work. In a design such as C53 we can see Delaunay's close relationship with modernism; this could stand equally well as a pure painting. Design 1189, fabric samples, France 1929, printed silk. This pattern is actually a good deal more complicated than it looks. I tried copying it, thinking I might use it for one of my own hooked wool works, but oh my! it was difficult to follow. I love seeing how different the mood is in each of the color combinations. Design 945: textile design, design card, France 1929; gouache, ink, and pencil on paper. A pattern like overlapping seashells, where different heights of line make up the shape, has a fresh openness to it. In the design card we can see the color thinking, the change of hue and value for each of the color ranges. 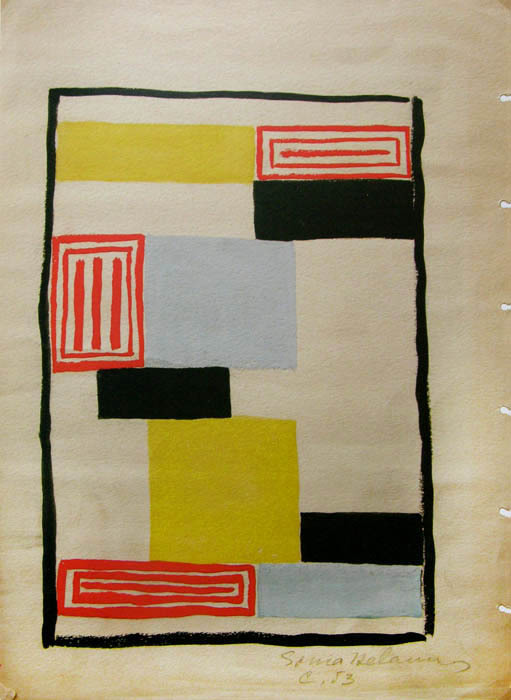 Design 1177, France 1933; gouache on paper. I love this design, its syncopated rhythm, and am quite sure I'll steal it one day for one of my own works. 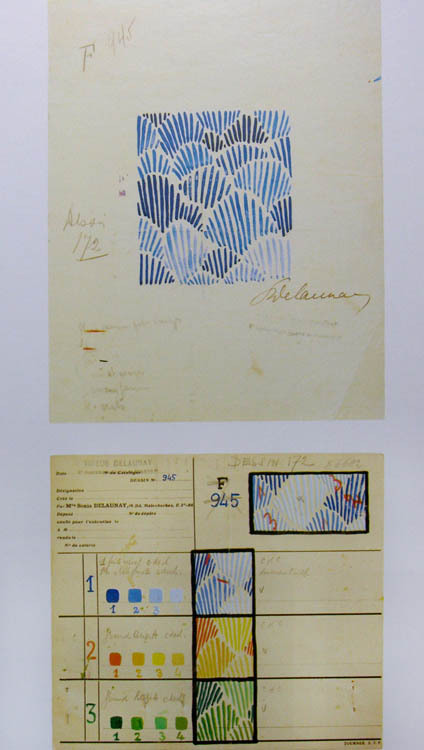 Design 951bis, fabric samples, France, 1929; printed silk. 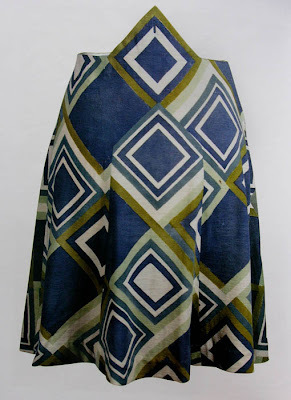 This is a very witty pattern, the overlapping lines looking to me like frayed fabric. Design 1317, working drawing, France, 1934; colorprint, pencil, and ink on paper. This pattern is so exuberant it makes me smile, as does so much of Delaunay's work. There is seriousness in the fact that these patterns are all for use, for printing on fabric; but the effect is incredibly joyous throughout. Scarf, produced by Liberty's of London, France, ca. 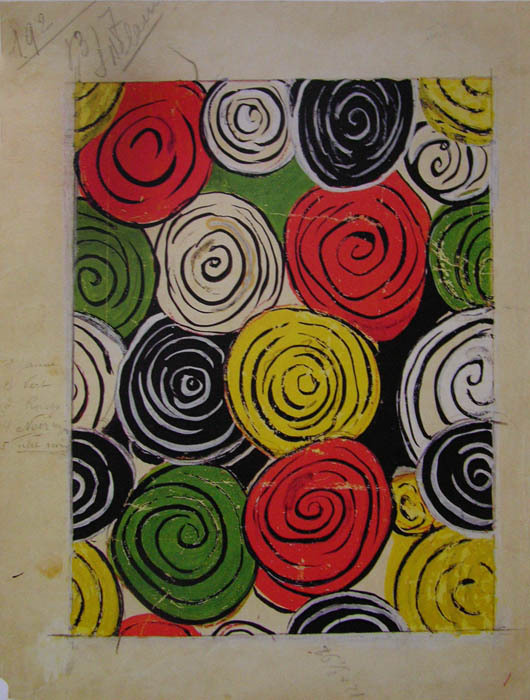 1967; printed silk voile. Later in her life, Delaunay became successful as a painter, so did not do many textile designs after the mid 1950s. This is one of the few scarf designs she did during that time, and it is very close to her painting in its form, with a beautiful array of colors, moving from subtle at bottom to more intensely contrasted at top. The work of Delaunay is a great lesson in the leveling of different fields of art, and in how foolish it is to assign hierarchies. I was so excited/inspired at her show at the Cooper Hewitt, glad you saw it, Altoon. I have the catalog too. it was joyous to see someone who just loves what she is doing and is a great but rare example of leveling hierarchies in the arts. I'm glad to know you're also a fan, Alicia. What is old soon becomes new again. 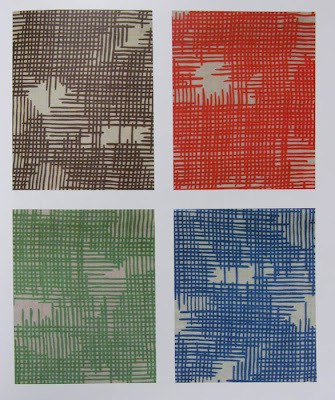 These patterns would be snapped up by the modernist movement lover now. Altoon, I'm even more excited to see her work at the exhibition at the Baltimore Museum of Art. I'm going to be doing an interview with Rena Hoisington, Curator of Prints, Drawings & Photographs about the show. I'll post it on our blog and facebook. I agree with you her work is wonderful. What I find most interesting is the way the designs change in the different colorways. A great example of how color works! Lisa, Delaunay's designs are certainly classic modernism. 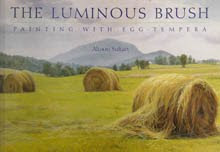 Karen, that sounds great about the coming exhibition; I look forward to reading about it. Linda, it is fascinating to see these very clear examples of color interactions. I've read that Sonia was much more intuitive in her paintings and color work than her husband Robert, who tended to be more theoretical. Her informed intuition stood her in good stead. I have been familiar with Sonia Delaunay's fabric works for quite some time and have found them enormously satisfying and inspiring. 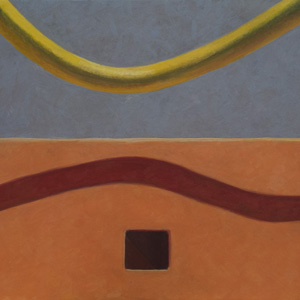 I had a reproduction of one of her quilts hanging on my studio wall for decades, not quite understanding why it mattered so much to me....until I moved from landscape into abstraction. And then, everything clicked. I love the skewed forms and the rhythmic energy. The exhibit at the Cooper Hewitt was superb! 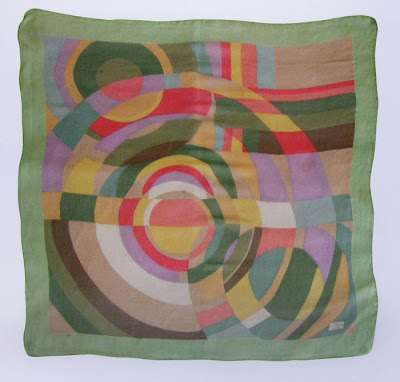 Tamar, it's fascinating how Delaunay's textiles were quietly working their way into your work. It's so interesting how our influences or inspirations occur. Wonderful post..insightful; some great examples. Love the color interaction samples and the silk scarf is a beauty! Inspiring. I'm glad you liked the post, Maggie. Excellent post! I am tweeting it to Mosaic Art NOW followers. There is wonderful information here about linear design. Grazie! Thanks for sharing the post, Nancie.